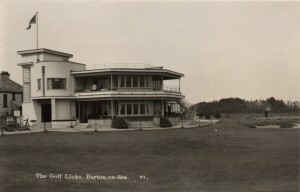 Golf has been a feature of life in Barton for nearly 120 years. It was first played in 1897 on the cliff top east of the Barton Court Hotel. The course was nine holes and was owned by the hotel. Although the course was for the use of the guests, non residents were allowed to play there for a fee. 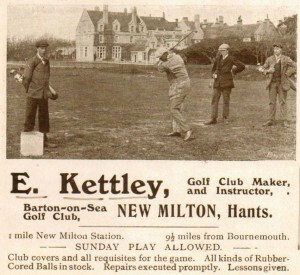 The attached 1910 advert for Mr E Kettley shows him teeing off in front of the hotel. It is notable that in 1910 a professional golfer and club maker could make a living in rural Barton. The location in this picture would now be on the shore line as a result of cliff slippage. The Barton Court Hotel can be seen in the background. Only a small section of this building survives today. The first club house was a corrugated tin building situated on Marine Drive East opposite the Marine Hotel. Next to the club house ‘Ye Olde Golf Cottage’ sold refreshments to the players and passersby. The game was so popular locally that a New Milton entrepreneur commissioned this porcelain model of a bag of golf clubs. The town crest is proudly displayed on the front of the bag. 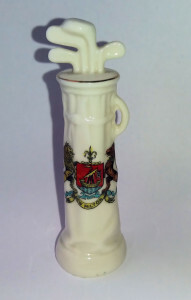 However it should be noted that the game of golf was extremely popular nationwide and so it is likely that this piece would have been sold elsewhere but with different emblems painted on. In 1910 a golf course was designed inland by 6 times Open Champion Harry Vardon, one of Britain’s greatest golfers. The course went as far north as Barton Drive and almost as far west as Sea Road. The course was eighteen holes. However it took up quite a large piece of prime Barton land and the pressures on the club from developers were such that it was sold in 1922. The owner of the Marine Hotel felt that a golf course would be an added attraction to his premises and so a new nine hole golf course was built on the cliff top. Once again the course designer was the renowned Harry Vardon. In 1928 the Marine Hotel was bought by a Mr Clark who was a keen golfer. He rented land to the east of Marine drive and had an eighteen hole golf course built on the site. The club house was a rather elegant art deco style building. 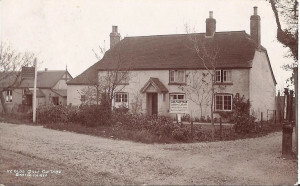 This image of the building is from a postcard dated 1940. The course was officially opened in June1932 with a number of invited professional golfers having an excellent match, which was reported in the New Milton Advertiser. Golf at Barton was still played during the Second World War despite the threat of invasion from the German army. Anti personnel mines were laid along the southern edge of the course in the rough. There was a wire fence to prevent people from straying into the minefield. Despite this however, in 1945 an army officer was killed when he went into the rough to recover a lost ball. In 1956 Barton on Sea Golf club came under threat again when the land and club house was sold to a Bournemouth property developer, a Mr Barnes. There were a large number of local people as well as golfers campaigning to prevent further development of housing on the cliff top. Through a major fundraising effort the members of the golf club were able to buy the site from the developer and the club became owned by the members. The next threat that the golf club had to overcome was not from the speculative builder but from nature. Over the years cliff slippage had slowly eroded the southern edge of the course. At one stage in 1972 there were calls to take over a part of Barton Common to replace the lost land, but this was rejected. Fortunately Becton farm next door to the course came up for sale and was bought by the club. A new 27 hole course and a modern club house was built. The club has gone from strength to strength. In 2015 it was awarded the Club Mirror award for golf club of the year. In addition to the facilities provide in the club house and the course the views of the Solent and coast line are stunning. 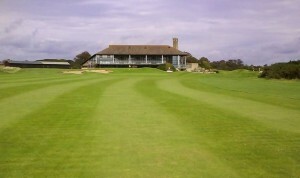 Oscar Wilde is cited as saying that “Golf is a good walk spoiled” but not in the case of Barton on Sea.